Contrary to popular belief, every now and then I make something that isn’t fingerless mittens. Sometimes I make hats! Actually, I do that rather frequently since they are also small, quick projects. 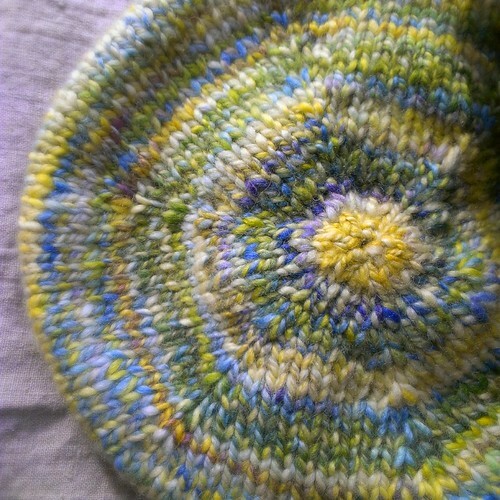 In December I started a hat using a pattern by Lee Meredith called Scant. It is worked top-down without swatching, so I thought it would be perfect for my handspun! I finished it in two days. Unfortunately, my measuring skills are not so great and it ended up too big at the brim. After having the recipient try it on, we decided I would pull out the ribbing and decrease a few rounds to bring it in. 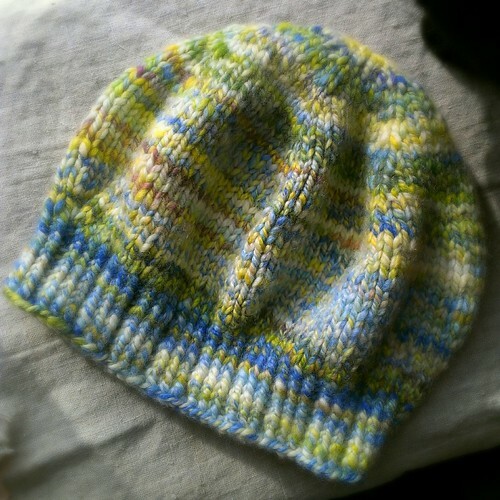 In fact, it was really easy to adjust since it was knit top-down. I decreased a total of 12 stitches over three rounds and used a smaller needle to get the ribbing even tighter. Once I reworked it, it fit great. I think there is more volume in my hat than was originally expected according to the pattern, but the new owner of this hat is very happy with it. I love the way the colors came out. I definitely will use this pattern again! That is some beautiful handspun and a lovely hat. 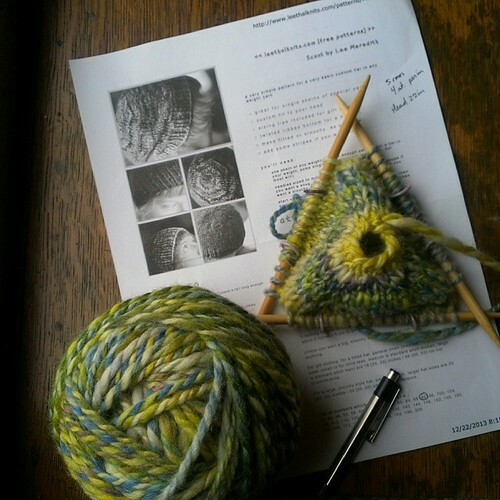 Makes me want to break out a few of my handspun skeins for hat knitting. Thank you, April! Go for it, get out that handspun! Previous Previous post: Winter Market!